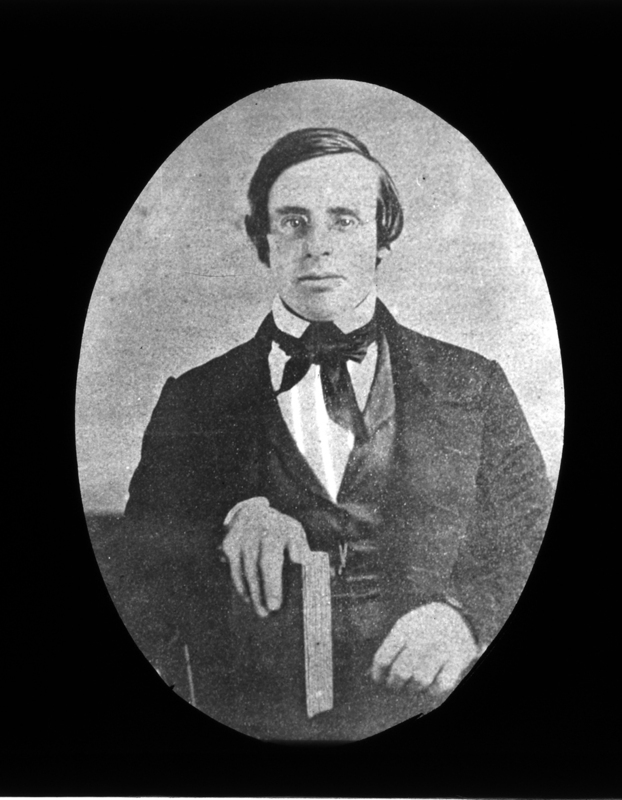 This is the Reverend Augustus Russell Pope (1819-1855), minister of Kingston’s First Parish Church, or as it was then known, First Congregational Society, from 1844 to 1849. The biographical piece linked above lauds Pope’s work in Kingston, particularly his work with the Town’s schools. 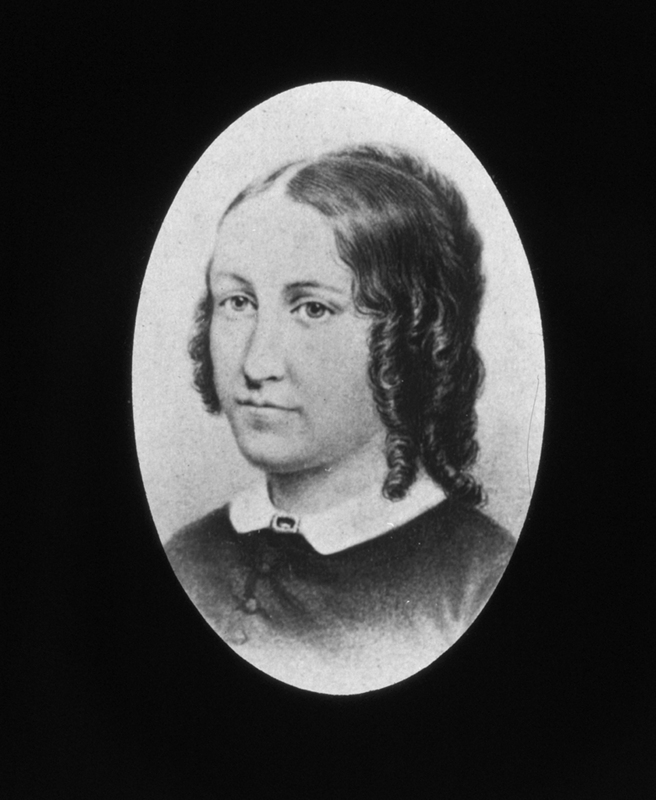 This is Lucy Ann Meacham Pope (1820-1870), the Reverend’s wife, who was originally from Cambridge. They married in 1843, just after his ordination. 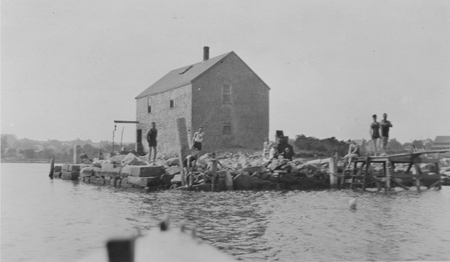 This is the lovely home they built at 4 Elm Street in 1844; it now houses Hope Floats. 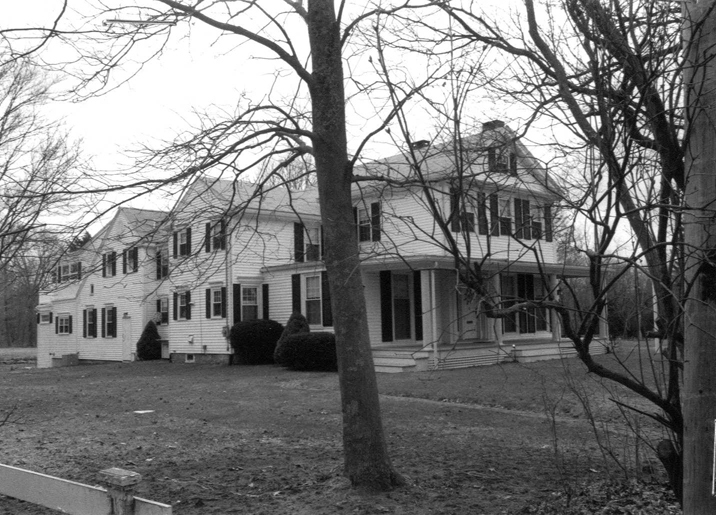 Reverend Augustus Pope House, 4 Elm Street, 1998. 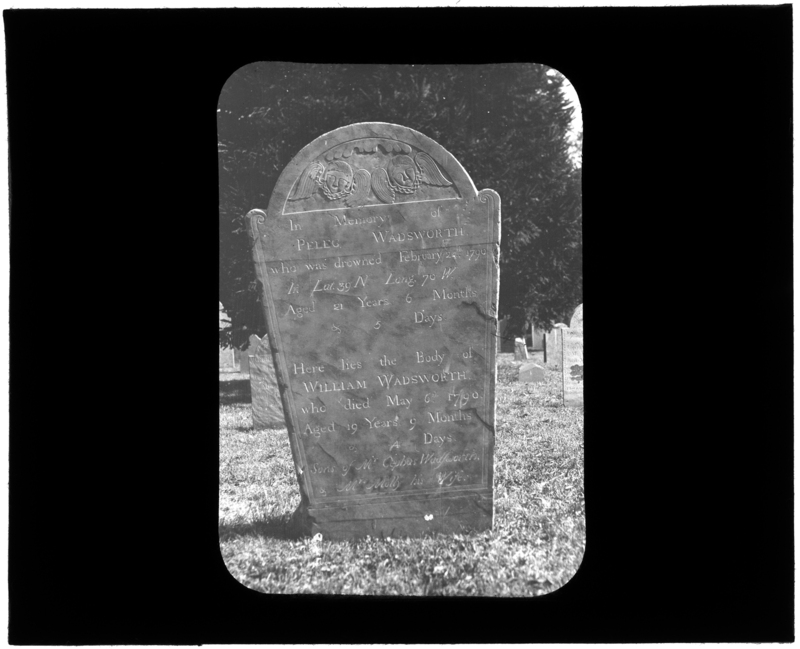 Photo from the Massachusetts Historical Commission. 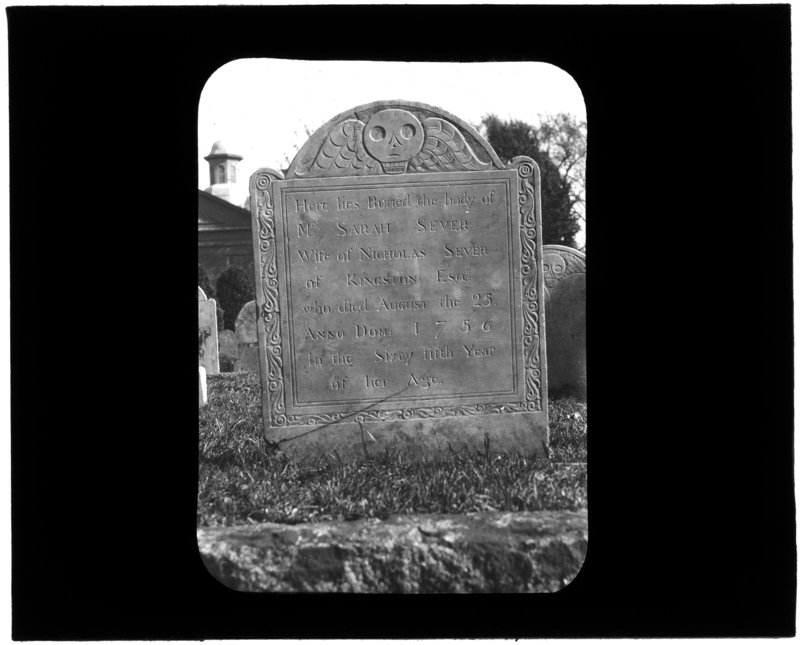 So, portraits of a couple who briefly lived in Kingston and a later photo of their house: is there more to this story? Why, yes, there is. And as sometimes happens when deep in the research, a clerihew popped out. Now appearing, for the first time since…well, almost forever. 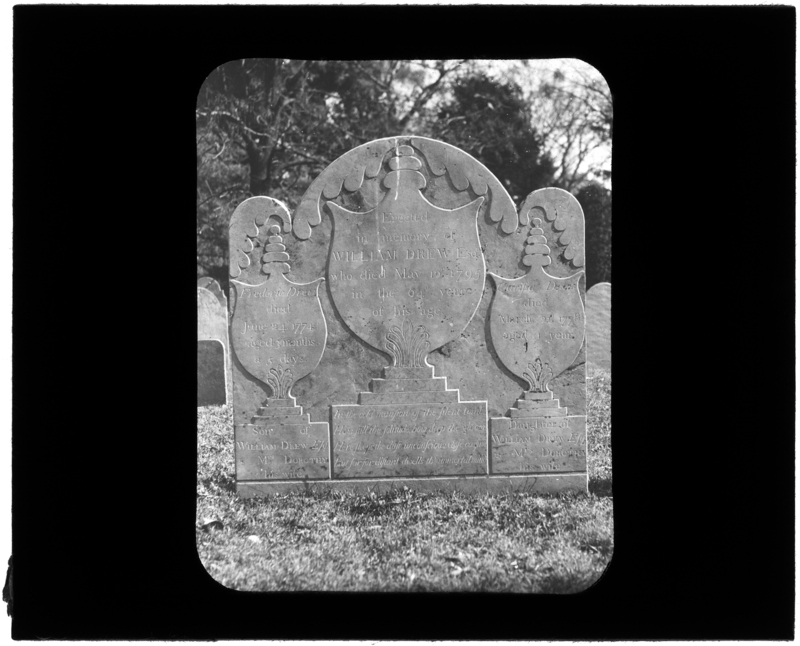 Old Meeting House, Kingston, Mass. 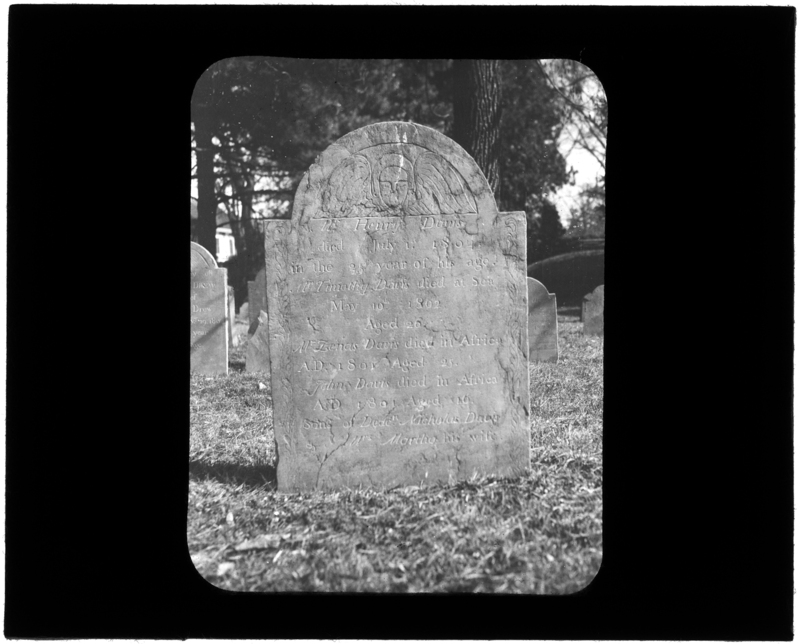 Built 1798. Demolished 1851. 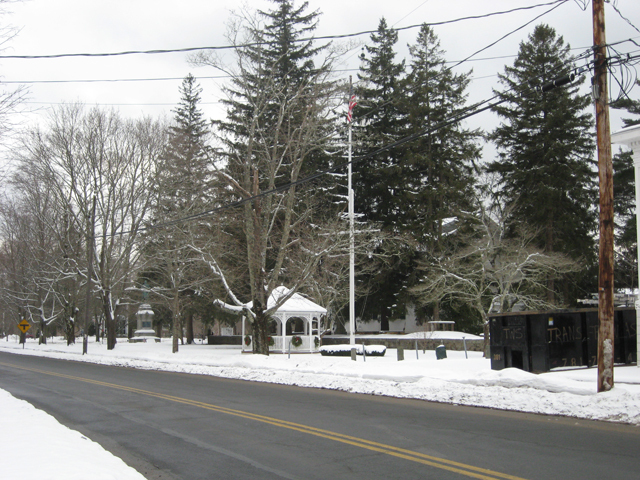 This is the Second Meeting House, which stood where the First Parish Church now stands on Main Street, next to the Training Green. 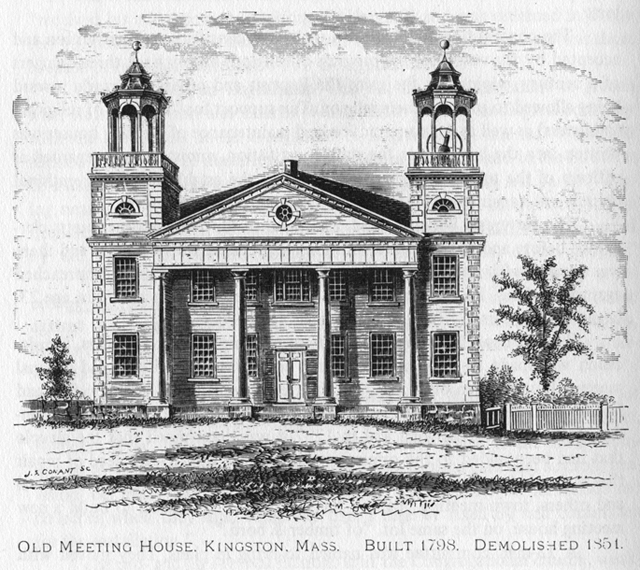 It served not only as the second building to house the First Parish, but also as the center of Kingston’s town government before the original Town House was built. We know a few things about it. There is the drawing above. There are written descriptions. Doris Johnson, in Major Bradford’s Town, gives the specifics of the 1798 “plans for a structure 60 feet by 55 feet and 25 feet high, with ‘projectments to be 10 feet added’.” Further, she quotes Sarah Bailey in Civic Progress. This was the large meeting house with the two belfries known to this generation only by pictures…It was unique in its exterior form, but inside it was a typical New England meeting house with high pulpit and sounding board, galleries on three sides, and square pews with doors and the seats that were raised while the congregation stood during the long prayer. 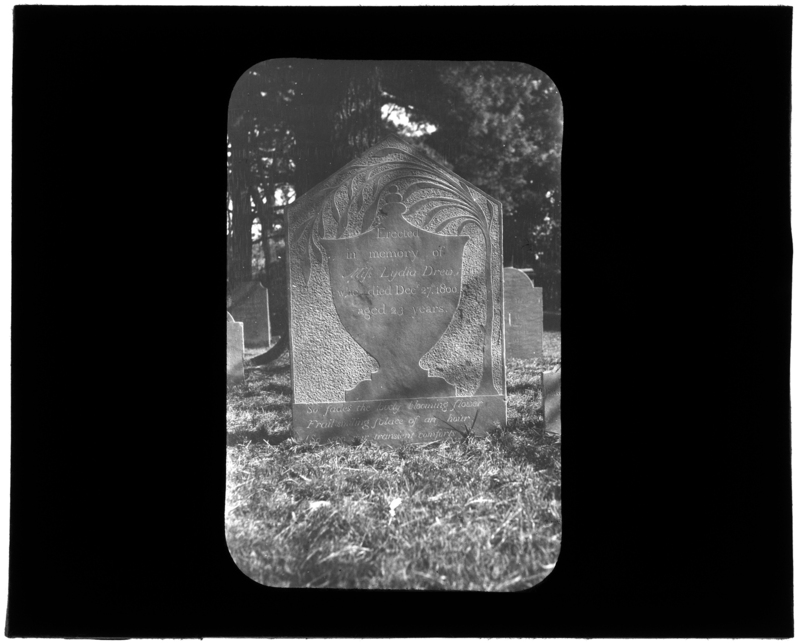 Mrs. Bailey’s generation may have known the Second Meeting House by pictures, but viewers in this century knew only the one drawing and the words. 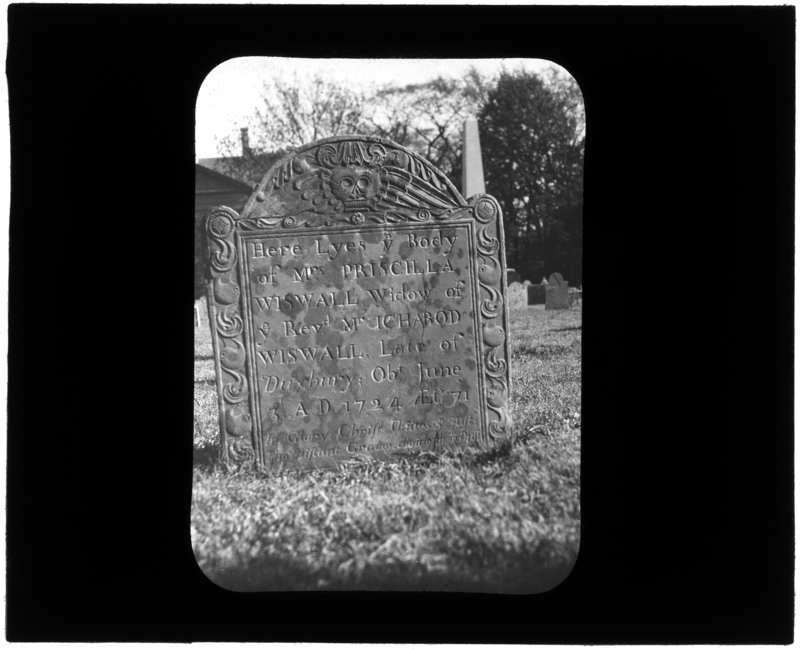 Part of a large new collection, the heavy celluloid negative from which this scan was made is a copy because film negatives did not appear until the 1880s, but the building was demolished in 1851. This image might even have been made before 1841, when the Old Town House was built: it would have stood to the right and behind the Second Meeting House in this view. That may be the sum of what we will ever know about this negative. Still for all the questions and all the unknowns, we now have a photograph that once disappeared into history, but has now emerged. All the recent snow reminded me of this photograph taken from Green Street. 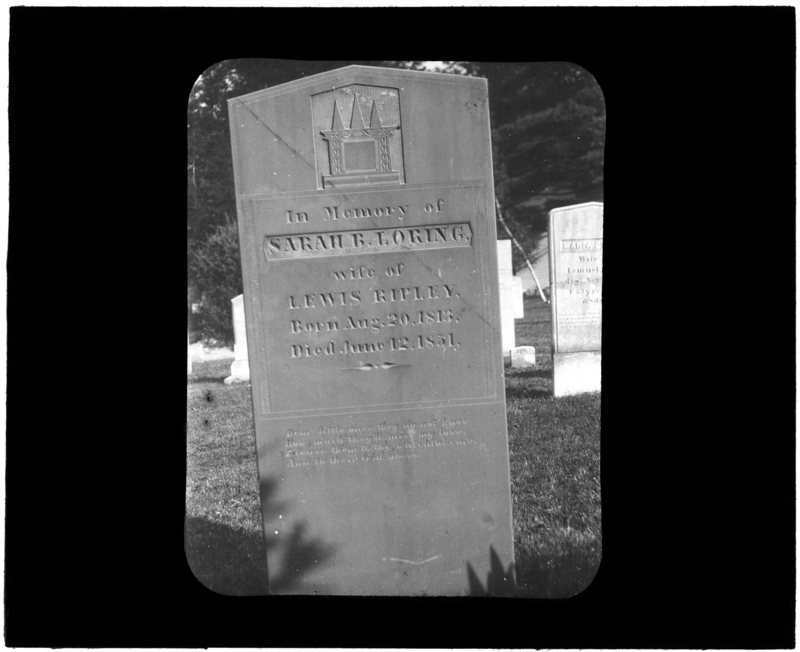 It dates after 1883, because the Soldier’s Monument is there, but before 1928, when the trolley stopped running. 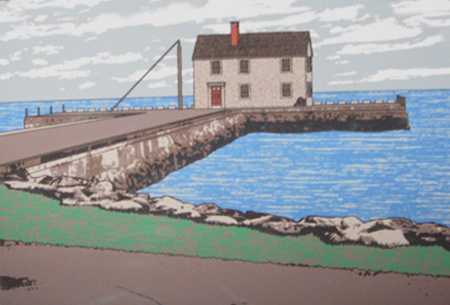 Once I found this one, I walked a little ways down Green Street to see if the view was the same. Christmas and Santa Claus are meant for children. This Christmas party was held in 1949 at the Beal House on Main Street for the Sunday School of the First Parish Church. 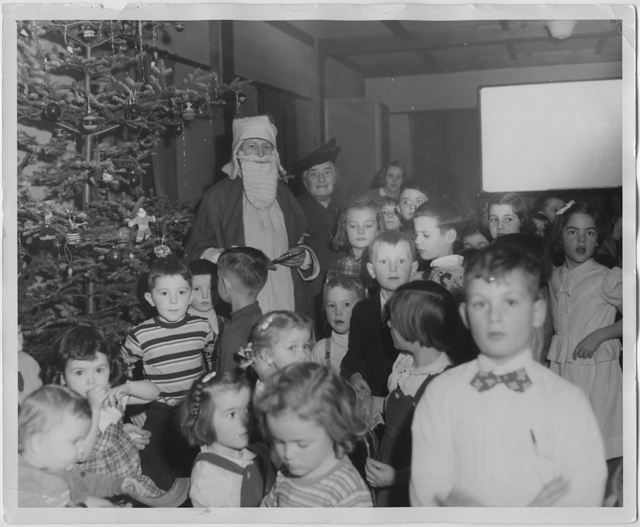 Frank Randall served as Santa and Helen Williams, the director of the Sunday School, stands to his right. Some of the excited children have been identified. Do you know any of them? How times have changed: that is a REAL evergreen tree decorated for the holiday! October 19 marks the 100th anniversary of St. Joseph’s Parish in Kingston. 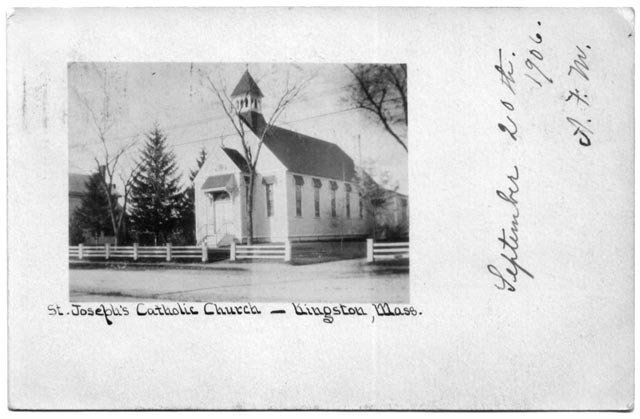 This postcard shows the Church’s first building at 261 Main St. Mailed from Middleboro and postmarked 9/21/1906, the card was sent to Miss Nellie McGinn who lived in Brighton, MA. 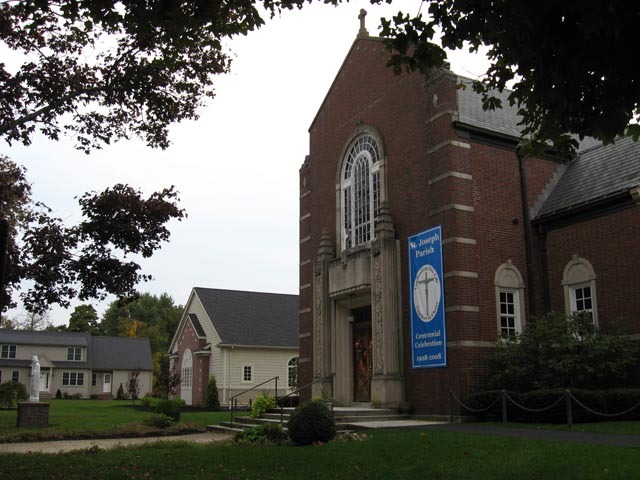 Built in 1882, the building was originally a mission chapel of St. Peter’s church in Plymouth, At that time, St. Peter’s served Catholics in Carver, Plympton, Duxbury, Hanson, and Marshfield in addition to Kingston and Plymouth. 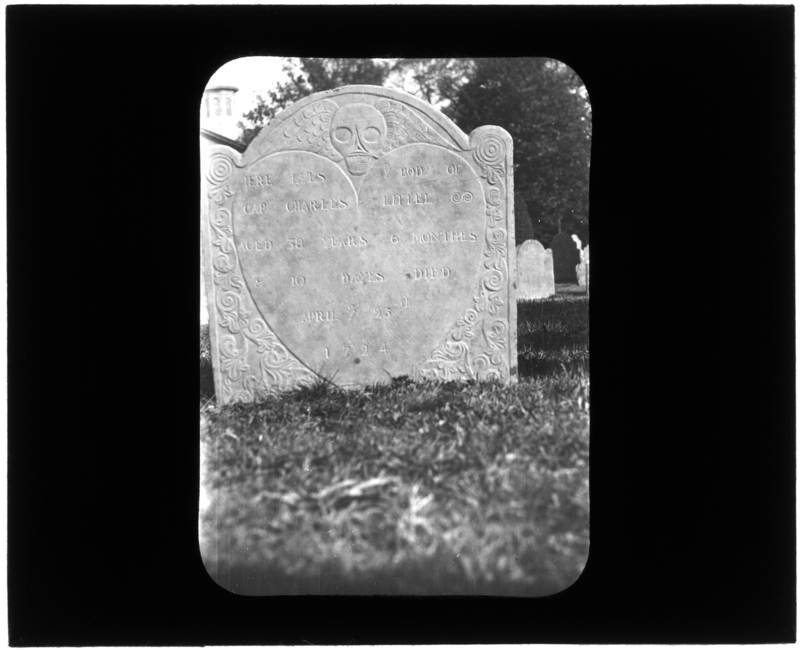 The earliest Catholic Masses in Kingston were celebrated sometime in the 1850’s for one of the first Irish families who were tenants living in the historic Bradford House on Landing Road. 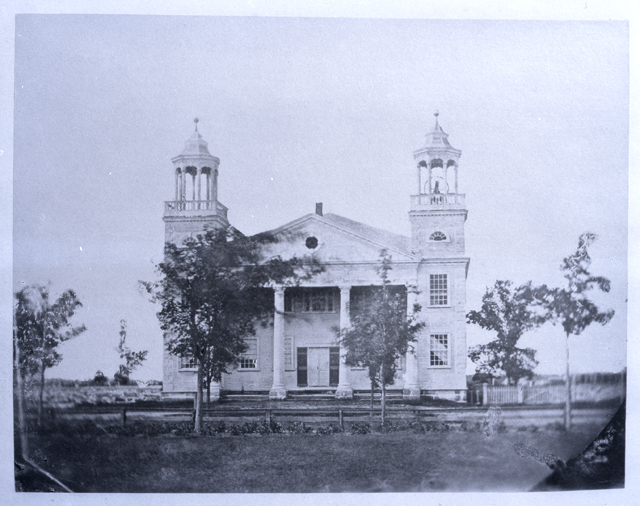 The mission to St. Peter’s was created in 1873. Today, this building houses St. Mark of Ephesus Orthodox Church. The name St. Joseph’s was adopted later, perhaps when the independent parish was established in 1908. 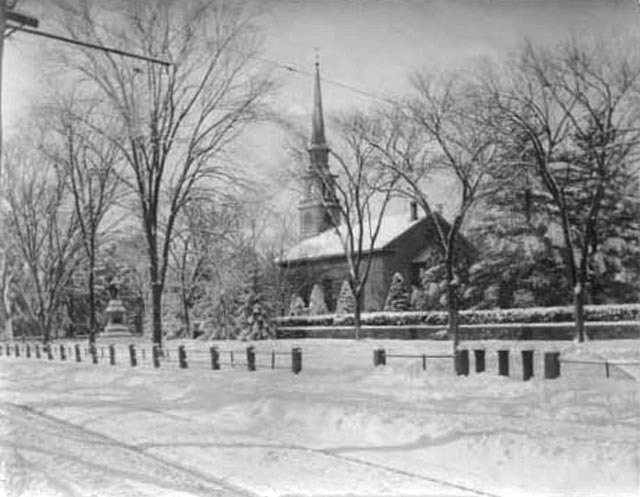 The present-day St. Joseph’s was built further up Main Street at 272, and was dedicated on December 1, 1935. This 2008 shot shows Our Lady’s Hall, the new parish center dedicated on May 13, 2006.